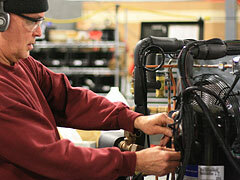 Preventive maintenance procedures should be performed regularly to keep the chiller system clean and well-maintained. In air-cooled chillers, any dust or dirt that accumulates on the condenser coil will insulate the condenser and reduce the transfer of heat from the refrigerant to the air. A dirty condenser also forces the compressor to work much harder than it should, which increases energy consumption and potentially shortens the life of the condenser. Air-cooled condensers should be vacuumed clean or chemically treated on a regular basis to remove dust and dirt particulate. A filter also can be used on the condenser inlet to prevent clogging. Any abnormal sound or substantial increase in noise level since the last weekly inspection may indicate an impending pump or fan problem, which should be corrected. Observation of fluid on the bottom of the unit or floor surface under the system calls for a further check for possible leaks. Any significant drop in the coolant level since the previous weekly check should be investigated further. If there is no visual system leak, then the loss may be due to leakage elsewhere in the equipment. A dirty filter can lead to a decrease in system performance in a short period of time. It is recommended that the filter be replaced after the first month of operation on new systems to ensure that the system runs at maximum capacity. After this initial filter replacement the filter should be replaced every 6 months under normal operating conditions. More frequent filter changes may be required under severe conditions. Periodically inspect the fluid inside the reservoir. The fluid should be clean and free of algae growth. If cleaning is necessary, flush the reservoir with a cleaning fluid compatible with the circulating system and the cooling fluid. It is important to flush, drain and refill every 6 months or each time the water filter is changed. To restrict growth of algae in the reservoir, it is recommended that the reservoir cover be kept in place and that all circulation lines be opaque to ultraviolet. This will minimize the entrance of light, which is required for the growth of most common algae. Contact our Opti Temp Customer Support Department if algae become a problem. The use of a corrosion inhibitor is recommended to reduce or eliminate galvanic corrosion. Opti Temp has a family of corrosion inhibitors called OptiShield (www.optishield.net). The cooling fluid needs to be monitored periodically to ensure protection is still being provided-a pH portable monitor is required to test for fluid flush and replacement. See the OptiShield web site for recommendation on when to change OptiShield. Some OptiShield products include Chloramine-T, an algae and biological growth control agent. Chloramine-T has recently been banned from shipment into some countries including the European (EU) countries. If using the OptiShield “Plus” products from Opti Temp monitoring of the free chlorine must be periodically monitored to ensure sufficient free Cl to reduce or eliminate biological growth. The OptiShield web site offers analytical monitoring equipment to measure pH for OptiShield, and Cl for the OptiShield Plus products. It is recommended that a visual inspection of the filter fins be made monthly after initial installation. After several months, the frequency of replacement should be established. For proper operation, the unit needs to circulate substantial amounts of air. A build up of dust or debris on the air filter or condenser surface will lead to a loss of cooling capacity. The frequency of filter replacement or condenser cleaning depends on the operating environment. The level switch indicates the user in the event of accidental loss of fluid. Since this switch is "passive" during normal operation, it is recommended to "exercise" it about once every 6 months, to make sure it is still functional and ready to alert the user. Test other switches in reservoir at the same time if installed. The fan assembly requires no maintenance. If the condenser cooling fins are dirty clean with an air hose and brush, and at the same time inspect the fan blades for accumulated dust and grime. Clean as required. As a precaution, the pump seals must be periodically replaced. This will avoid damaging the unit and the cost associated with excessive downtime. The replacement period depends on pump type, hours of operation, flow produced, and operating pressure. Replacement Filter Assemblies, filter cartridges, pH and Chlorine Test Products may be purchased directly on the OptiShield web site (www.optishield.net ).